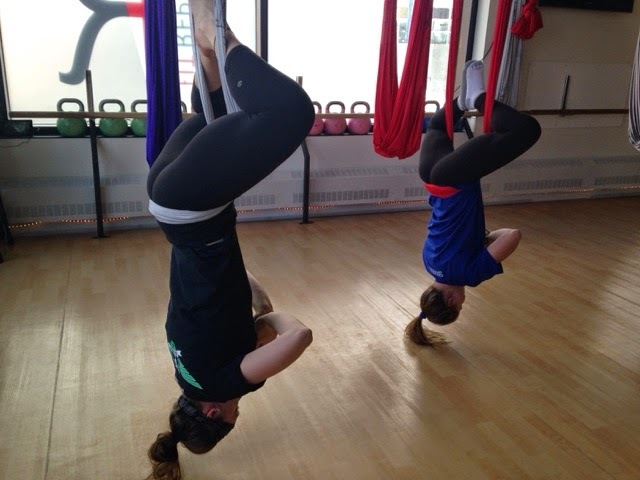 The first time I heard about aerial yoga I thought it was kind of silly and something you only see stick thin, bronzed, bohemian-fit girls do on pinterest. Buuuuuuut then I found out there was a studio in YYC and I couldn't resist gaining the experience. Thank you Fit Republic. My good friend Talia joined me on this little 'sunday funday'. We walked into the small studio and I instantly felt out of my comfort zone. There were 7 or 8 other members of the class already hanging monkeys and looking like professionals. Let's call them the professional monkeys. Anyways, the first thing you do when you're at a class like this is size yourself up a stretchy satin hammock. Once you're all ready, the instructor starts directing you through various poses. Some are simple stretch poses, others are more physically demanding, and some are inverted like in our pictures. It may look like we're zenning out in this picture, however, not all poses were incredibly comfortable. 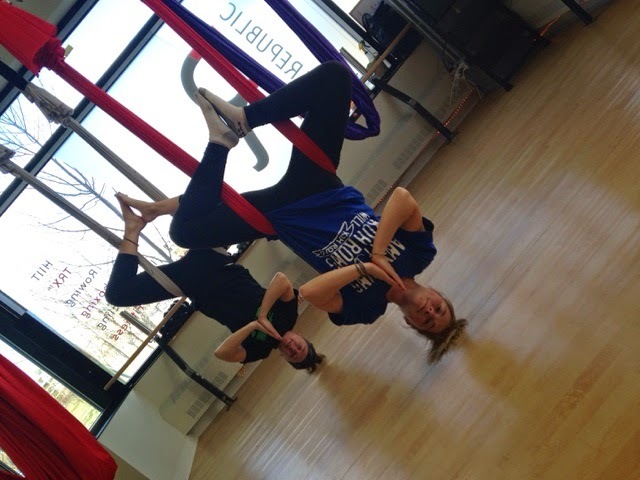 One pose referred to as 'tweety bird' was particularly uncomfortable for my bunions (ew...). Other poses intensely 'massaged' hip flexors and shoulder joints. I look forward to going back to #fitrepublicyyc. It was a great way to try something new and mix up my regular workout routine.